Silver, the new villain being introduced here, is a vampire hunter who suffers from real-time psycho-delusions. To him, as far as his mind can tell, Gotham’s vigilante protectors are all part of a vampire coven who keep the city under their thumb, deliberately keeping things miserable for the populace. To him, the greatest supervillains of the city are all freedom fighters, fighting to free the city from the vampires’ oppression. Its an interesting spin on the mania, and I admit that I quite liked it. As if Barbara didn’t have enough to deal with, Silver complicates things further. With this issue, Gail brings back the female Talon Strix to this series. A Japanese immigrant young girl who was inducted into the Talons by the Court of Owls and whom Batgirl fought against early on in this series, Strix is now a member of the Birds of Prey alongside Barbara. She now comes to Barbara looking for her help with a missing persons case, a young girl who, just like her, cannot speak. This entire subplot highlights how many problems Strix goes through. To not be able to communicate verbally, and being looked on as nothing more than muscle (which is kind of how Christy Marx’s current run on Birds of Prey has sadly characterised her as), is a rather terrible position to be in. Plus, we get to see her character actually develop here, and that’s all pretty damn great. Gail Simone has always been good at earthing her characters to their roots. Whether this is done figuratively or otherwise, it is always apparent in her scripts, and this issue is no different. A lot of the problems that Barbara and Strix go through in this issue are a reference to the earliest issues of this series, and even then, back to when Alan Moore gave us the controversial maiming of Barbara Gordon back in the now-classic The Killing Joke. These are experiences that have changed characters and Gail highlights all of that in this issue with her trademark flair. And Silver himself is an interesting villain with all his delusions. He seems a bit shoehorned in here, given that there is no setup for ihow he came to Gotham and what exactly he is doing here and who he really is. Hopefully, it is something that that will be explored in the next issue, because it is something that I’m really interested in seeing. The first year of the series gave us a lot of different villains, and I’d be quite happy to see Silver added to that great line-up. On the art-side of things, I really don’t have any complaints here. 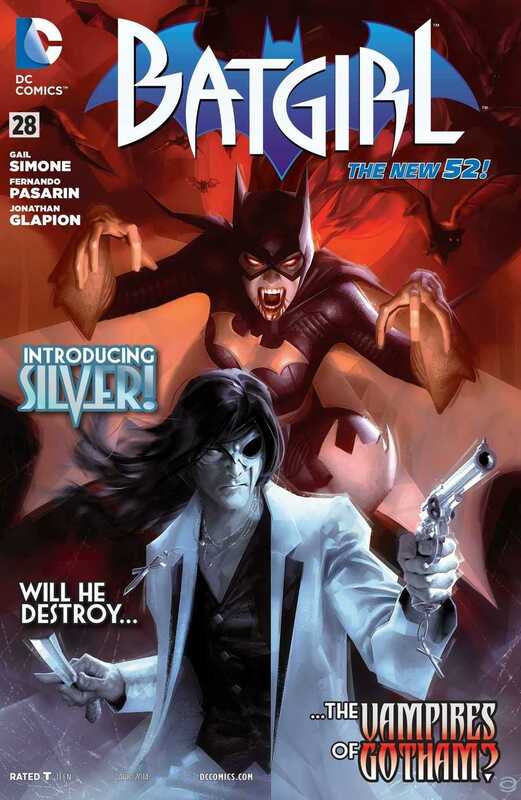 Fernando Pasarin, Jonathan Glapion, Blond and Dezi Sienty give a lot of great moments in this issue, especially when Silver and his assistant go toe-to-toe against Barbara and Strix. A lot of really good action panels in the second half, with quite a killer twist right at the end. One thing that Pasarin does really well is showing the characters in a lot of different poses. He seems to be getting better with each issue, so that’s a pretty big plus. If there’s any criticism that I have of the art, it is that sometimes Barbara’s face is drawn a bit too long and a bit too angular, which is very odd. Other than that though, this was a pretty interesting issue, and I’m looking forward to more. More Batgirl: Vol.1, Vol.2, #23, #24, #26, #27. Posted on February 13, 2014, in Comics Reviews, Review Central and tagged Action, Alex Garner, Barbara Gordon, Batgirl, Blond, Charise Carnes, Comics, Comics Review, Crime, DC Comics, Dezi Sienty, Fernando Pasarin, Gail Simone, Gotham, Jonathan Glapion, Knightfall, Review, Review Central, Silver, Strix, Superheroes, Talons, Urban Fantasy, Vampires, Vigilantism. Bookmark the permalink. 12 Comments. I agree. I love the action scenes and how he positions Barbara’s body in general. The pose where she’s dropped down from the top of the building to deal with the college gang was especially cool. As someone who has read the Batgirl title on and off (missing some of the stuff with Strix from the earlier storyline), I did really enjoy her interaction with Barbara here, but it does remind me quite a bit of her relationship with Cass. Not that that’s inherently a BAD thing because their relationship was great, but it does make me miss Cass just a little bit more. And I agree about the faces thing with the art. I love the body shots, but some of the reaction panels look a bit off. I’ve only read one of the Batgirl volumes with Cass, the second run with Beechen before Stephanie Brown stepped in with her own series. I liked it. It was decent.